Customers have been creating shared group orders on DoorDash’s website for years. As more customers used our apps, ordering together on mobile became our most-requested feature. The existing web group order feature worked well for offices, but not for friends on the go. Luckily, the existing web feature gave us some learnings to start with. For example, there are two main actors in a group order: a Creator and Participants. Creators need more control than average DoorDash customer experience. Meanwhile, to prevent order-wide mistakes, we restricted Participants to just their order. While the project involved translating existing web features to mobile, the new form factor also let us reconsider the sharing and guest experiences. Like regular customers, Creators can find restaurants, add items, and checkout. Once they add friends to the order, Creators get extra controls to manage the group order. Creators connect the cart to their credit card, so an extra level of control is necessary to reduce any risk. They can set order limits, remove items from the cart, and remove participants from the cart. Only the creator has the ability to checkout. I also explored how Auto Checkout and Scheduled Delivery times could work. Ultimately these features seemed more appropriate for office managers than the average consumer. They also added complexity to the MVP, so we saved them for later. Different states and explorations for how ASAP/Scheduled deliveries could work with an Auto Checkout Time and Specified Delivery Time. The original web group order experience produced a link that creators could manually copy/paste into any application. This was sufficient for offices, but not ideal for friends ordering quickly together on the go. On mobile, creating a group order immediately opens an action sheet loaded with native applications like Messages, Facebook Messenger, and Slack. Sharing through native apps creates a much smoother experience. For example, choosing Messages opens a new message where the creator's contacts are easily accessible. The Group Order link is already included with the message. Once sent, the group order link converts to a custom message with a Join button that deep-links participants to the restaurant menu. Sending the message returns the creator to the cart so they can place the order. There are two types of Participants. We created native app experiences for existing DoorDash users and a mobile web experience for those joining as a guest. All participants are able to join group orders and add/edit/remove items to their cart. Unlike Creators, the participant experience is limited to their part of the order. They’re not able to change order parameters, change menus, or check out. Despite these restrictions, several new features greatly improved the Participant experience. Easy Sharing: We made it possible for Participants to share the orders with others so it's easier for everyone to join quickly. The Creator can remove people, or delete the cart, if necessary. Group Order Tracking: It can be tedious waiting for your food. Adding group orders to each participant's order history let them track group orders for the first time. Participants receive updates via push notifications or text messages so everyone is well informed. Access to Support: I was most excited for new functionality that let participants get support on their order. Before, there was no recourse for participants if their food was missing or incorrect. Being the only person to not receive your food is a terrible experience. Now, if anything goes wrong, participants can request a refund for their part of an order. Making orders easier to share seemed like a great way to introduce new customers to DoorDash. We believed creating a satisfying and complete guest experience would lead to more customer sign-ups in the long term. Two-Path Landing: New users can create an account. Because the group order Creator entered delivery and billing information we can also let anyone join orders as a guest. Relevant Menu Content: Information about delivery price, pricing promotions, and delivery address isn't relevant to guests. Actions for creating a group order and changing a menu also aren't necessary. Removing this content let us put food front and center for a more focused ordering experience. Mobile Web Tracking: Anyone can start feeling anxious when hungry. We made sure guests were also able to track the order through mobile web. Guests can also create an account from this page to get help on an order. Converting guests to users for support also serves as one of the company's cheaper customer acquisition channels. Adding group orders to mobile let DoorDash build custom integrations with iMessage. 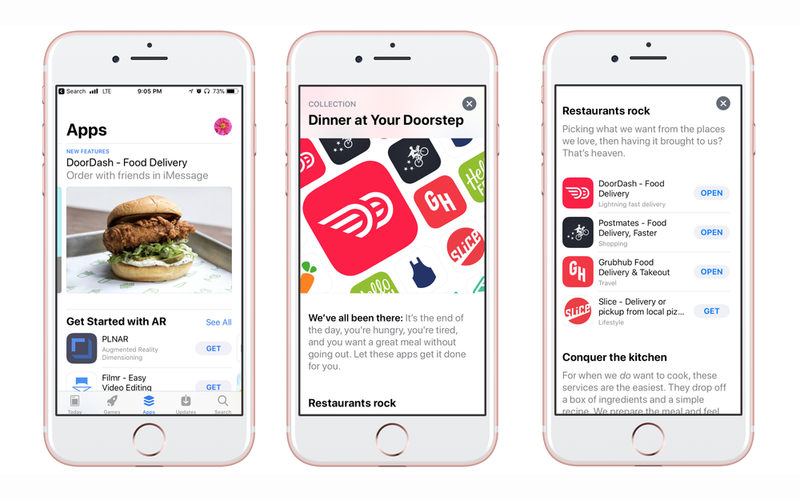 As a result, Apple featured DoorDash above competitors throughout the AppStore.